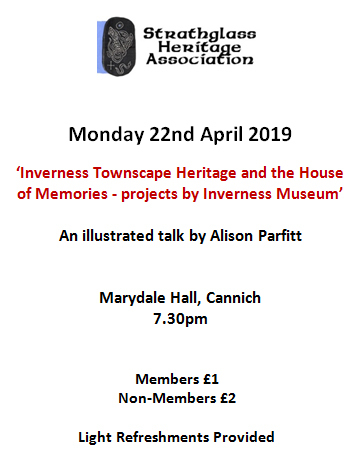 Inverness Museum Curator Alison Parfitt will be discussing the Academy Street Townscape Heritage Project. Alison will outline recent work with communities as part of her role at Inverness Museum & Art Gallery, showcasing the House of Memories project and the new digital trail for Academy Street. 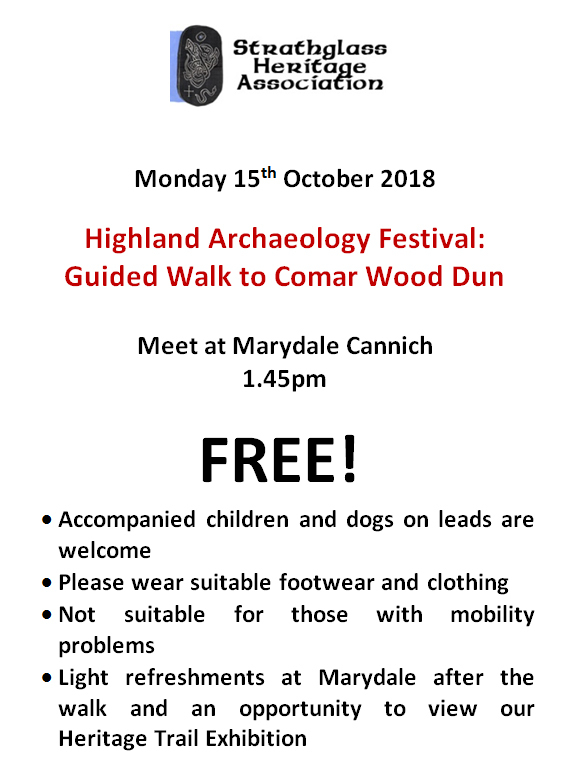 Highland Archaeology Festival - Guided Walk: Comar Wood Dun - Monday 15th October 2018, Meet Marydale Hall, Cannich 1.45pm. No charge. Accompanied children and dogs on lead welcome. 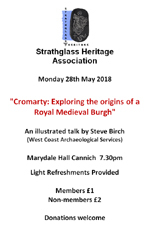 Light refreshments and Strathglass Heritage Trail Exhibition afterwards at Marydale. We now suggest meet at Marydale in Cannich as opposed to forestry road (as per instructions on HAF website) to enable car sharing. Project leader Simon Gunn discusses the excavations of the caves that began in 2006. The finding of human remains created a lot of excitement especially as they were of a murder victim from 1400 years ago. 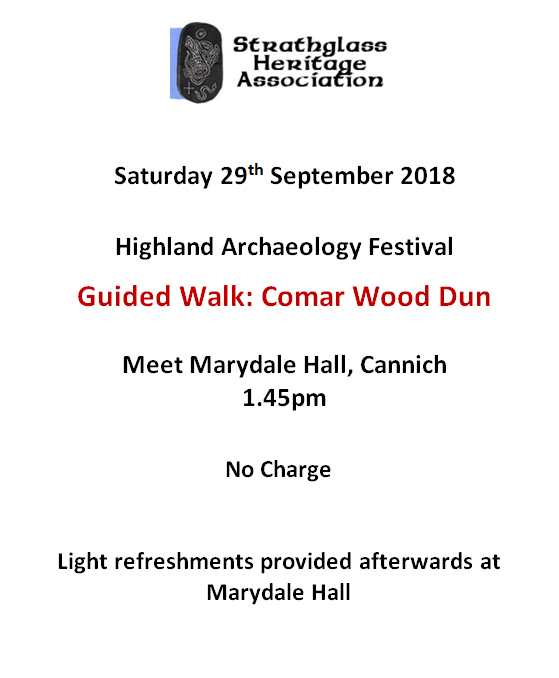 Highland Archaeology Festival - Guided Walk: Comar Wood Dun - Saturday 29th September 2018, Meet Marydale Hall, Cannich 1.45pm. No charge. Accompanied children and dogs on lead welcome. 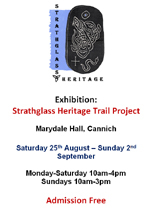 Light refreshments and Strathglass Heritage Trail Exhibition afterwards at Marydale. 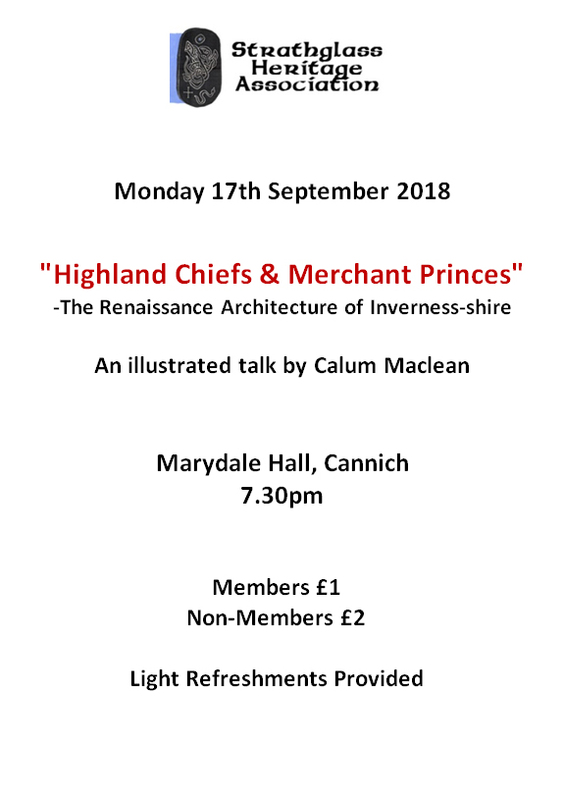 Conservation architect Calum MacLean discusses the most interesting architectural period in Inverness and its surroundings – between 1600 and 1740 – and how the local architecture changed incorporating ideas and influences from Europe during this period. 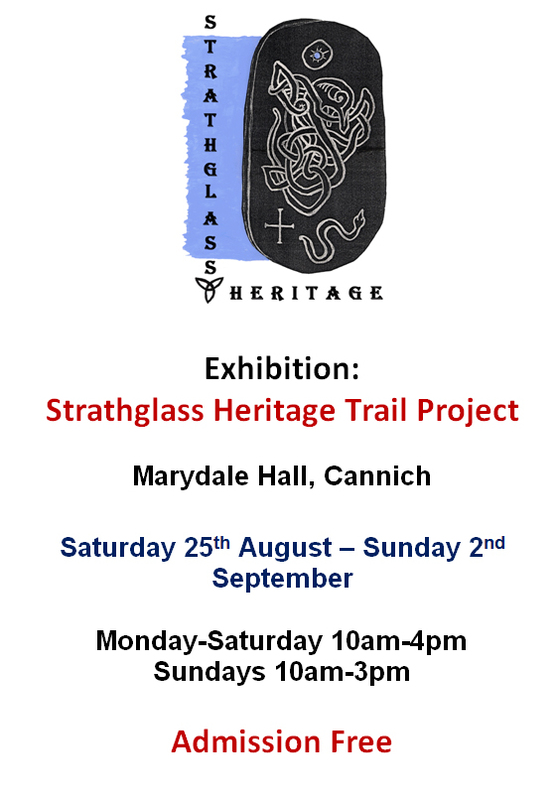 Exhibition: 'Strathglass Heritage Trail Project' - Saturday 25th August - Sunday 2nd September 2018, Marydale Hall, Cannich. Free Admission. Open Mon-Sat 10am-4pm, Sunday 10am-3pm. Exhibition displaying information on our new Heritage Trail Project. Details of all the sites under consideration. 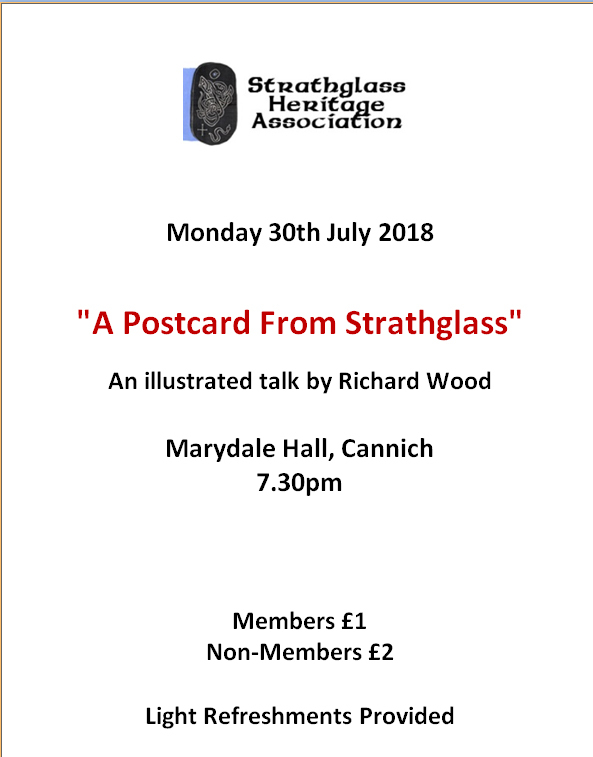 Richard Wood presents a selection from his vast collection of old postcards with a particular emphasis on images of Strathglass and surrounding area dating back to the late 19th century. 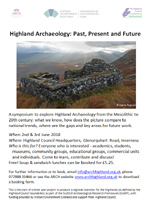 Highland Archaeology: Past, Present and Future - 2nd & 3rd June 2018, Highland Council Headquarters, Glenurquhart Road, Inverness. 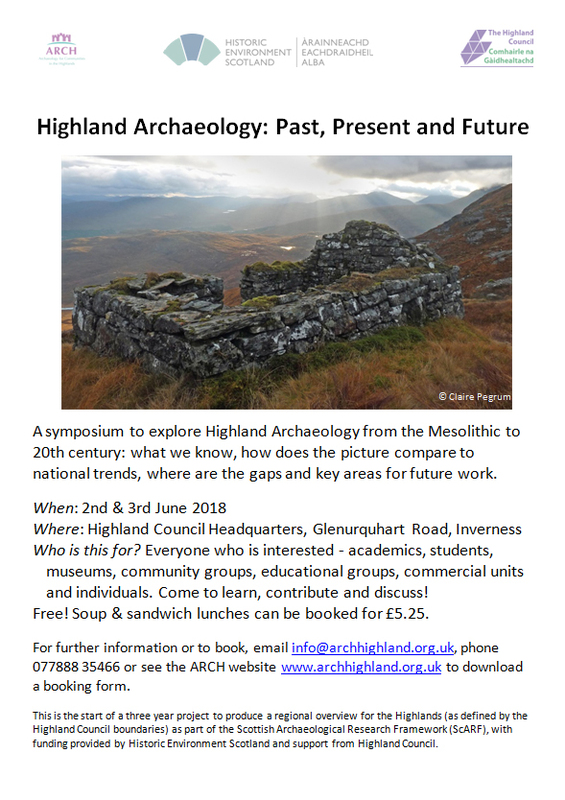 A symposium to explore Highland Archaeology from the Mesolithic to 20th century: what we know, how does the picture compare to national trends, where are the gaps and key areas for future work. 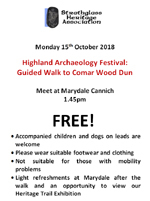 Open to everyone with an interest in archaeology in the Highlands. 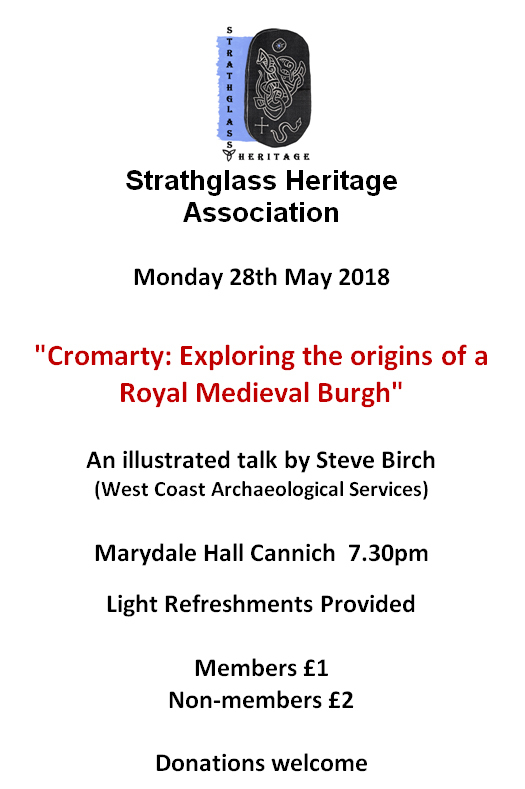 An illustrated talk by Steve Birch on potentially one of the most significant Scottish medieval excavations carried out between 2012 and 2016. 'Pop-In' - Wednesday 23rd May 2018, Marydale Hall, Cannich 2-4pm. An illustrated talk by our chairperson Marjorie Wilson on her visit to St Kilda, the isolated archipelago situated 64 km west-northwest of North Uist, in the North Atlantic Ocean. It contains the westernmost islands of the Outer Hebrides of Scotland. 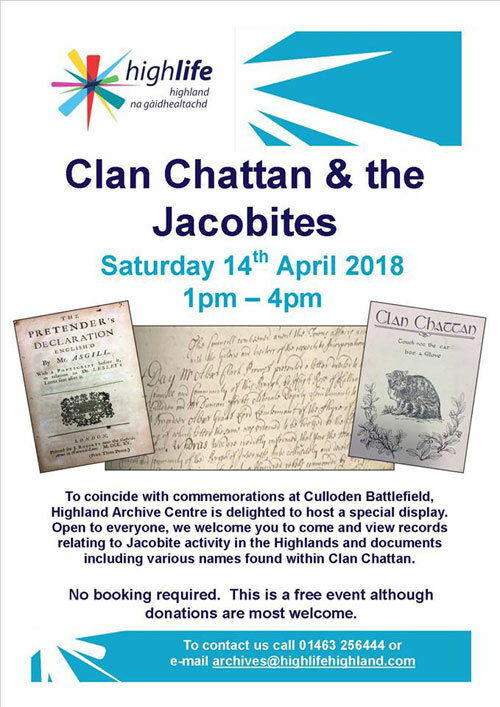 An event to commemorate the Battle of Culloden. 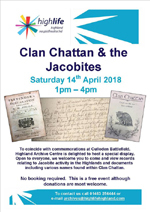 Displays of material relating to Jacobite activity in the Highlands and documents including the various names associated with Clan Chattan. No booking required. 'Pop-Up' - Wednesday 14th March 2018, Marydale Hall, Cannich 2-4pm. Pop in to discuss our plans for this year and any other any heritage. Archives available and a cup of tea provided. Bring along any items of interest. Members Only. 'Lost Inverness' - Friday 2nd March 2018, Glenurquhart Public Hall Annexe, Drumnadrochit 7.30pm. 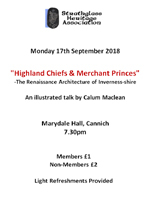 Glenurquhart Heritage Group welcome Norman Newton who will give an illustrated talk on “Lost Inverness.” If you are interested in what Inverness used to be like then come along. Lots of nostalgia promised! 'Pop-Up' - Wednesday 6th December 2017, Marydale Hall, Cannich 2-4pm. Pop in to discuss any heritage matter or perhaps view the archive while having a wee cup of tea. The 1841 Census for Strathglass will be available. Bring along any items of interest. Members Only. 'Pop-Up' - Wednesday 8th November 2017, Marydale Hall, Cannich 2-4pm. Pop in to discuss any heritage matter or perhaps view the archive while having a wee cup of tea. Bring along any items of interest. Members Only. 'Clan Chisholm & Highland Dress' - Thursday 26th October 2017, Marydale Hall, Cannich 2.30pm. Duncan Chisholm, Past-President of the Clan Chisholm Society and acclaimed kilt maker. 'Pop-Up' - Wednesday 11th October 2017, Marydale Hall, Cannich 2-4pm. Pop in to discuss any heritage matter or perhaps view the archive while having a wee cup of tea. Members Only. 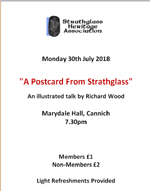 'Gaelic Place Names in Strathglass' - Monday 2nd October 2017, Marydale Hall, Cannich 7.30pm. 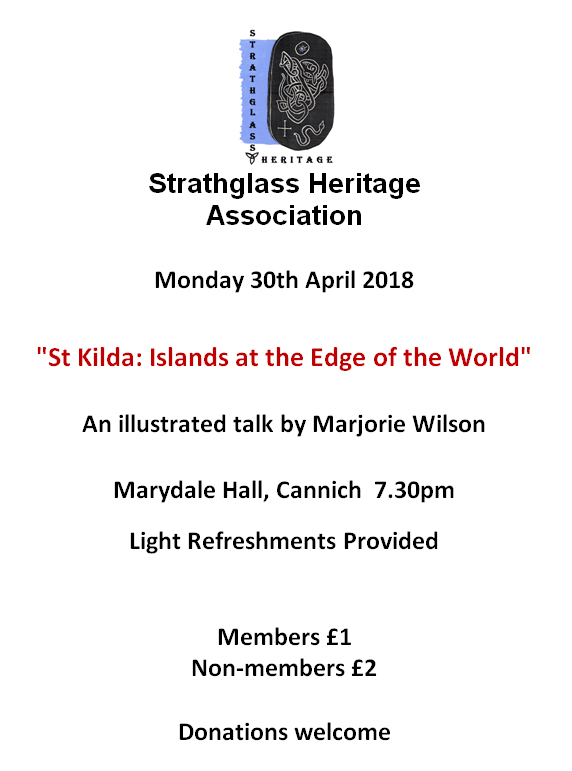 An illustrated talk by Morag McDonald – a great chance to find out the meaning of place names in Strathglass and the surrounding Glens. Our very own Dennis Ross returns with a second presentation on his metal detecting activities. He will also have a number of items recovered from sites across the local area and beyond. 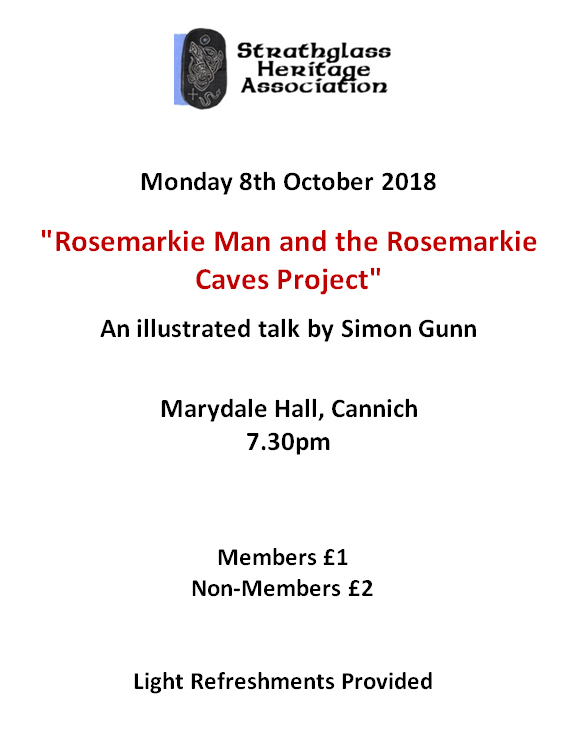 Members and prospective members are most welcome to attend. Afterwards there will cheese & wine etc and an opportunity to inspect our archive material. Agendas will be sent to members in advance of the meeting. Matt Ritchie from Forest Enterprise Scotland presents an illustrated talk on some of the most interesting measured survey and visualisation work of the last few years within Scotland’s National Forest Estate. Anne Fraser, Family Historian at the Highland Archive Centre in Inverness will be giving a talk on the resources available to those wishing to research their family history. This includes records for Church, School, Poor Law, Health, Property, Crime, Estate & Family Papers. Highland Archaeology Festival 2016 - 1st to 16th October 2016, Various locations throughout the Highlands. he festival is provided by the Highland Council and runs over two weeks each October to celebrate the heritage of the Highlands. Whether you are a seasoned archaeologist or a complete beginner, the festival will let you explore an amazing range of places and collections. 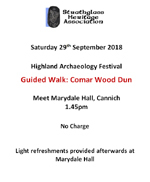 The programme includes a wide array of events provided by local experts and national organisations and includes walks, talks, tours, workshops, exhibitions and much more – all focussing on Highland heritage from prehistoric times to the 20th century. There’s something to suit everyone and many of the events are free! For further information visit the Festival website. We are very pleased to welcome former guardsman, shepherd, author and cattle breeder (to name only a few of his occupations!) Iain Thomson who will be with us to give his much awaited illustrated talk on the the drove roads. 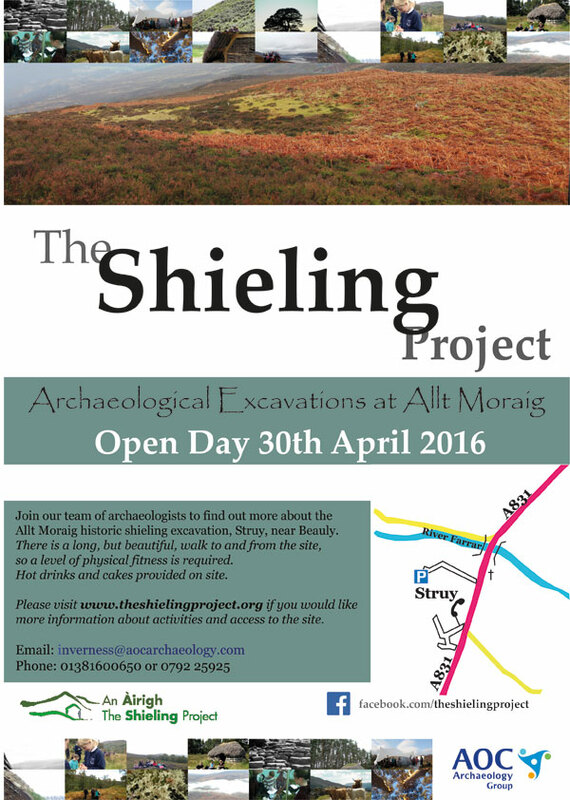 Open Day during Allt Moraig shieling settlement excavations taking place in Struy (NGR 3275 3827). The Open Day is free, and will give a chance to find out about our exciting discoveries on our last day of excavation, as well as an opportunity to meet the team from The Shieling Project and AOC Archaeology Group. There will be tea and cake for visitors. We must stress that due to the location, there is a level of fitness required for accessing the site. There is a long (3.5km), but beautiful, walk to site. The route has good tracks but a steep climb initially, however offers beautiful views and the chance to see archaeology in its wider landscape setting. There are interesting sites along the way and it will be worthwhile for those who enjoy spending time outdoors and anyone interested in heritage. AOC Archaeology can be contacted at inverness@aocarchaeology.com. ‘The Monster Canal’ - Thursday 21st April 2016, 7.30 pm, Marydale. Stephen Wiseman, Heritage Officer for the Caledonian Canal will present an illustrated journey considering the built, natural and cultural heritage aspects of the Caledonian Canal and the ongoing work to celebrate it with communities. Members most welcome to attend the AGM. Please inform committee members of any matters you think should be included on the agenda. Light refreshments will be served after the business is concluded. 'The Highland shieling: a tradition with a future?' - Thursday 31st March 2016, 7.30 pm, Marydale. Dr Sam Harrison who is Executive Director of An Àirigh / The Shieling Project currently being developed at Struy will visit us to tell us about the aims, objectives and possibly how members may be able to contribute. The Shieling Project is a social enterprise working with teachers and young people to explore the natural and cultural heritage of shieling life and its significance today. Each summer, for a long stretch of our past, young people all over Scotland would play an integral role in taking the livestock up to hill or moorland pastures, camping there in small bothies, learning about the world beyond the village. The project aims to bring the shieling back to life for young people and teachers. This involves learning how to milk, make butter and cheese, cut peats, weave, dye and re-build shieling huts. We explore the rich cultural heritage of story, song, poem and place-name around the shieling, understanding the changing ecology of the upland landscape, and the resonance of the shieling for our times: food, sustainability, health and well-being. 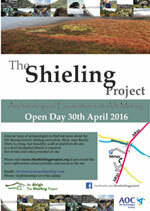 Read more about the Shieling Project on Facebook.